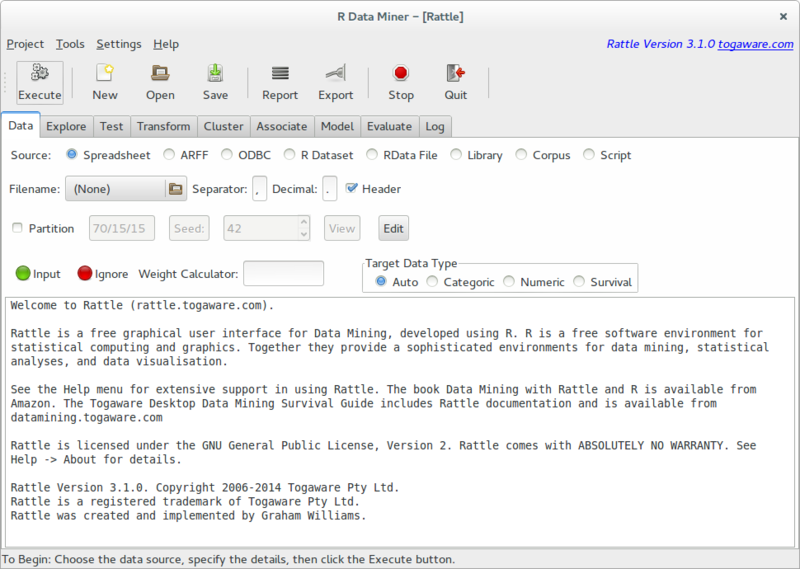 Rattle 3.1.0 is now available on CRAN. This represents ongoing bug fixes and functionality improvements. Numerous updates of plots to use ggplot2 rather than base graphics: ROC curves, riskchart, box plots, histogram plots, pairs plot, Benfords. Advanced Graphics is now the default, reverting to tradition graphics where needed. The migration to ggplot2 is ongoing. Added a rescale option to kmeans. New function normVarNames() to normalise variable names to a standard preferred style. Evaluate -> Error Matrix has been updated to report averaged class error and to report class errors. Evaluate -< PrvOb plot bug fix for non-missing data. INSTALL: Remove old INSTALL file – visit rattle.togaware.com for installation instructions. plotNetwork() has been removed – not used by Rattle and generally of limited use. See onepager.togaware.com for the code. No longer report repository revision number in version or about. Miscellaneous bug fixes and stability improvements. Display a pairs plot under the Explore tab, choosing the Distributions option, and clicking Execute. Click the CheckBox for BoxPlot of MinTemp. On the Model tab, choose the Decision Tree option, then Execute, then the Draw button. On the Evaluate tab, choose the Risk Chart option to evaluate the performance of the classification model.